Can you help us with our goal to build 20 gardens? Learn more this Saturday! VINES set a goal to build 20 gardens by 2020. We currently have 14 built and are looking to the community for suggestions of new locations. Could you help us out? RSVP to VINES' Community Garden Proposal Workshop THIS Saturday! 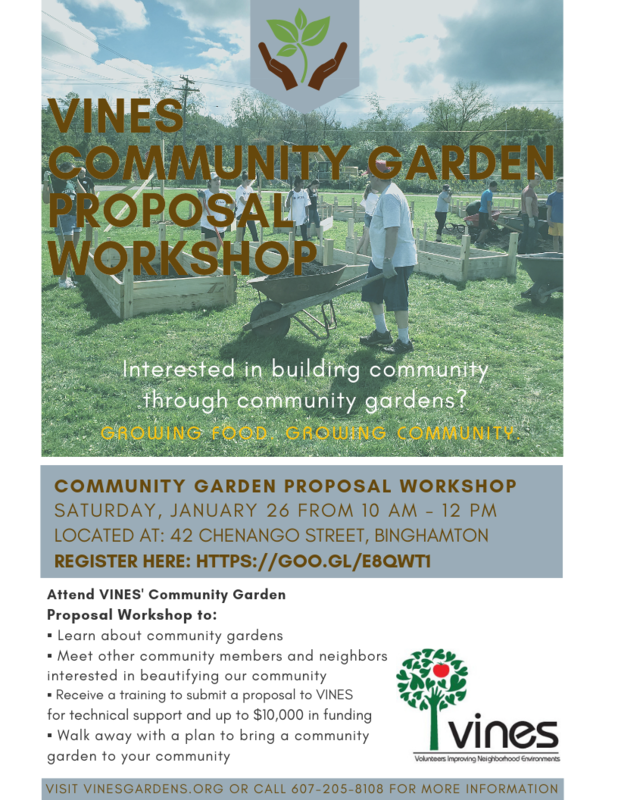 To submit a proposal you must attend VINES Garden Proposal Workshop on Saturday January 26 from 10-12pm in the Upper Lounge at United Presbyterian Church (42 Chenango Street, Binghamton 13902). This workshop is mandatory and a required step to completing a VINES Community Garden Proposal (either this year or next year). The workshop is also a helpful training for those interested in learning more about VINES' Community Gardens and how VINES selects and builds community gardens with neighborhood support. PLEASE RSVP HERE: https://goo.gl/e8QWt1 If you are unavailable to make this workshop but intend to submit a proposal please notify VINES immediately for alternative scheduling information. Community Garden Proposals are due Friday, March 15, 2019.